Imagine how wonderful it would be if you had one of those magical bags from cartoons that look so tiny but have everything you could ever need inside, from a needle to a tent. Unfortunately, we still don’t have those in the real world, but there’s a decent alternative. Scouts, adventurers, and military specialists have come up with extremely useful pocket survival kits that can be used in a wide variety of situations – from camping to outdoor survival. Pocket survival kits are usually packed in small tins. They’re practically necessary for any outdoor adventure or emergency situation. 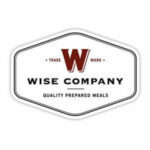 Preppers love them and so will you, as soon as you find the perfect pocket kit for your needs. 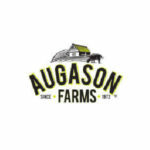 Read through our detailed descriptions to learn more. Main Features: Be Prepared Pocket Survival Kit contains more than 20 useful emergency tools. The kit is officially licensed by the Boy Scouts of America. Be Prepared Pocket Survival Kit is one of the best emergency products you can purchase nowadays. Everyone who enjoys spending time outdoors should consider getting this pocket survival kit. It’s great for any nature adventure or unexpected situation, as it contains many super useful tools. 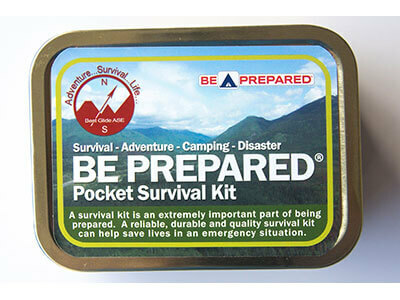 Be Prepared Pocket Survival Kit is designed to help a person survive in extreme conditions for 1-3 days or even longer. 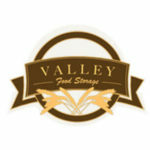 Take it with you wherever you go and you can rest assured that you’ll have the tools you need for any type of situation. This emergency kit includes highly useful tools like all-weather survival matches, razor knife, water bag, pocket wire saw, and many other items. There’s even a small survival guide that features some great tips for any emergency situation. Many of the items in Be Prepared Pocket Survival Kit are approved by the US Military and NATO, which can give you peace of mind that you’ve got military-grade equipment on you. This excellent pocket survival kit can be ordered online and shipping is charged in accordance with the delivery address and weight of the package. Main Features: ChanKu Emergency Survival Kits 10 in 1 comes in a sturdy ABS-plastic box that is waterproof and abrasion resistant. Includes 10 tools perfect for various survival situations. ChangKu Emergency Survival Kits 10 in 1 is a dream come true for every adventurer and prepper. It contains first-rate survival tools that can be of a great help in any emergency scenario. The items are perfectly packed in a small, yet resistant case and can easily fit in your backpack or pocket. There are 10 tools in the kit, but don’t let this number fool you. In addition to regular tools like compass, flashlight, sharp knife, and whistle, ChangKu pocket survival kit also includes the highly useful multi-functional Swiss card. For anyone who’s not too familiar with this item, let’s say that the Swiss card can help you open your beer or change a tire on your bike. It’s a can opener, ruler, wrench, screwdriver, and a mini saw in one. Most importantly, it can fit in your wallet. Therefore, no matter what kind of emergency occurs, you can be certain that ChangKu pocket survival kit can help you survive it. You can order ChanKu Emergency Survival Kits 10 in 1 online and it can be delivered anywhere in the world. If you’re in the US, shipping is free. Unfortunately, if this isn’t the case, you’ll have to pay a shipping fee. Main Features: SharpSurvival Survival Tin features 10 high-quality tools that can come in very handy in any emergency situation. It can easily fit in your pocket, backpack or bug-out bag. One of the best pocket survival kits on the market is definitely SharpSurvival Survival Tin Emergency Preparedness Survival Kit. This small, compact survival kit contains highly useful tools such as pocket knife, fire starter, razor blade, wire saw, fishing line and hooks, and a few other items. There is even an unusual compass/whistle/mirror combo, as well as an emergency mylar blanket. The blanket is rather big, 130 x 210 cm (or 52 x 82 inches approx. ), which is pretty surprising considering the size of the kit. SharpSurvival emergency survival kit is perfect for any camping trip, hiking adventure or even emergency situation. It’s a great survival gear for all preppers, adventurers, and nature lovers. SharpSurvival survival kit is so light and small that it can fit either in your pocket or backpack which makes it a great addition to your emergency equipment. 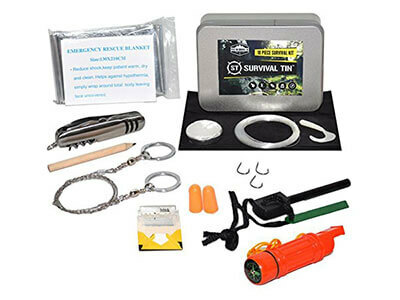 SharpSurvival Survival Tin Emergency Preparedness Survival Kit is available for online purchase and can be delivered internationally, but you’ll have to pay for shipping. 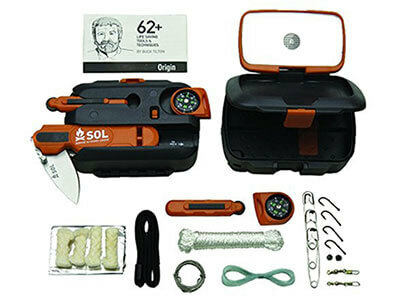 Main Features: Survive Outdoors Longer Origin Survival Tool is an extremely useful emergency kit that contains more than 10 survival tools. It’s packed in a waterproof ABS-plastic case. Survive Outdoors Longer offers useful tools for anyone, even for inexperienced survival beginners. Their Origin Survival Tool is a true treat for anyone who plans to spend some time outdoors or is preparing for unexpected emergencies. It features extremely helpful tools followed by comprehensive survival tips written by Buck Tilton, a wilderness medicine expert. With Origin Survival Tool, you can be certain that you have all the necessary tools for any camping, fishing or hiking trip. It’s designed to help anyone interested in well-organized preparedness and/or outdoors activities since it represents an outstanding survival gear. Origin Survival Tool kit is so tiny that it’s really surprising it contains so many items. Inside this small sturdy box, you can find Tinder-Quick fire starters, stainless steel wire, nylon cord, and an emergency fishing and sewing kit. But that’s not all! 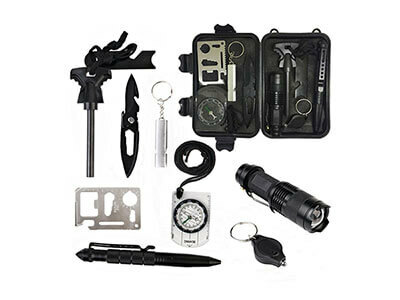 Some additional tools can be found in the lid of the case, including a signal mirror, compass, and versatile folding lock-blade knife with a 100db whistle. Additionally, there’s a strong LED light integrated into the handle. Unfortunately, this emergency kit can’t be shipped internationally, but you can receive it anywhere in the US. Main Features: Kungix Outdoor Emergency Survival Gear Kit comes in a waterproof zipper bag. This pocket survival kit contains 7 high-quality emergency tools. 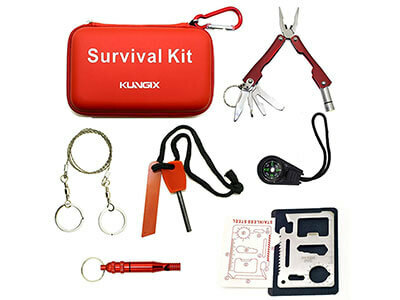 One of the best emergency products from Kungix is undoubtedly their Outdoor Emergency Survival Gear Kit. This extraordinary kit keeps you prepared for unexpected emergency situations and helps you enjoy your outdoor adventures even more. Outdoor Emergency Survival Gear Kit is a minimal pocket survival kit that can be of great help if you find yourself anywhere in the wilderness. It might be small, but it’s very well equipped and comes with superb survival tools. Kungix pocket survival kit features a fire starter, compass, wire saw, emergency whistle, multifunctional pliers with an integrated flashlight and six repairing tools, and Swiss card made of stainless steel. Each of these items is of the highest quality and can meet all the needs of any camper or adventurer. All the tools are packed in a small resistant case that can fit in your pocket, drawer or bag of any size. No matter where you are, you can have your Kungix Outdoor Emergency Survival Gear Kit delivered to your door, but keep in mind that you’ll have to pay the delivery fee too. How often do you need a knife or a flashlight when you find yourself outdoors? Countless times, for sure. That’s because you haven’t explored the limitless potentials of survival kits. For all of you who prefer to keep it simple and not use too much of your storage space, we have chosen the best pocket survival kits. Prepare yourself for any kind of emergency or disaster with a tiny survival kit that can fit in your pocket or bag. Even if you don’t believe a zombie apocalypse can happen or you’re not afraid of tornadoes, you should have a pocket survival kit just in case you need a knife to open a bag of potato chips. Our top 5 picks are all top-of-the-line emergency gear. Every pocket survival kit on our list features an incredible number of useful tools for any outdoor adventure or emergency situation. All of them also come in handy sturdy cases that are easy to pack. They are very resistant too. Each of these kits has a lot to offer, so it will be easy to find one that can meet all your requirements. Make a list of things you want to have in your emergency kit and choose a pocket survival kit that features all of them or even includes something you didn’t think of. Order one of the best pocket survival kits today and get prepared for any situation.